The 64 dishes that make up the MeerKAT radio telescope will be fully integrated by March, according to Dr Lindsay Magnus, head of operations at Square Kilometre Array (SKA) SA. Magnus, speaking ahead of minister Naledi Pandor's visit to the SKA site in Carnarvon, Northern Cape at the weekend, said scientists from around the world have lined up to conduct research using the MeerKAT radio telescope to answer big science questions. MeerKAT is overseen by the Department of Science and Technology, which is headed by Pandor. According to Magnus, some of the questions scientists hope to answer include a better understanding of the black hole, pulsars and neutron stars, and whether there is other life in the universe. Magnus noted that out of the 64 dishes, 50-odd dishes have already been integrated. "By March next year, we should be able to make some observations as we expect all the 64 dishes of the MeerKAT to be integrated. In time, we will get more information on those new projects." Regarded as the most powerful radio telescope in the Southern Hemisphere, the MeerKAT will form 25% of phase one of the SKA. The SKA project is an international effort to build the world's largest radio telescope to be hosted in SA and Australia. The radio telescope project will be made up of thousands of dishes that will enable astronomers to survey the universe and the entire sky much faster, and in more detail, than any system currently in existence. Construction of the SKA is set to start in 2018, with early science observations in 2020. 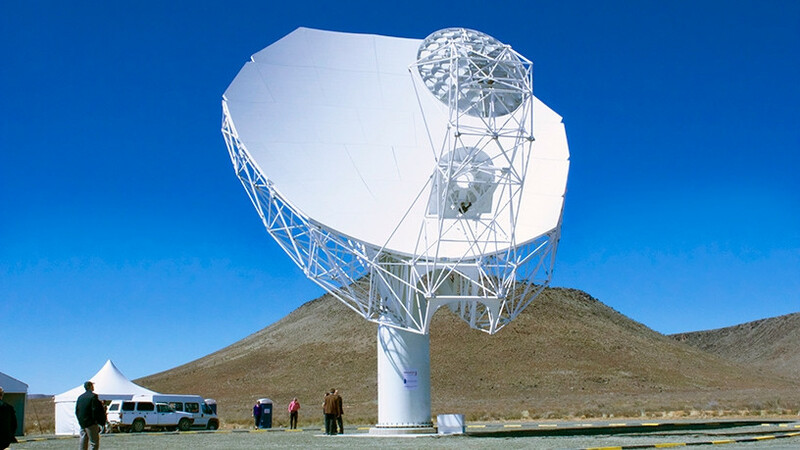 Speaking about the socio-economic opportunities of SKA, Pandor said the radio telescope project will bring major development to the small Karoo town of Carnarvon. "Hundreds of scientists are going to come to use the telescope and they will need to be supported, to be accommodated, to be looked after and we are going to need appropriate facilities for them in these towns, so there is immense opportunity." The minister visited Carnarvon to open a road, a training centre as well as hold a community information-sharing engagement on issues relating to science and technology and the socio-economic challenges faced by residents. According to Pandor, Carnarvon, Williston and other surrounding towns will benefit from educational and economic opportunities once research commences at the radio telescope. Pandor added SKA will be the biggest radio telescope in the world and it will position the Northern Cape as a knowledge hub for astronomical research. "Scientists will use the SKA to try and understand how the universe evolved, how stars and galaxies form and change, as well as unravelling the mysteries of dark matter and dark energy. "Scientists expect the SKA will make new discoveries unimaginable at present," she concluded.